I love curating book lists for kids so much, I’ve put together over 200 children’s book lists. Because of my obsession this, people often ask me about how to find good children’s books. Most of my parent friends confess they choose reading material for their children based almost exclusively on what their child brings home from school, what’s displayed prominently on bookstore shelves, or get random suggestions from other moms and dads. While there is nothing wrong with those techniques, there are other methods, too! Of course you don’t have to go out and do lots of research, and you definitely don’t have to read every book at the library before handing it to your child, and you could just rely on my book lists! 🙂 But, for those of you who want to learn how find the best children’s books on your own, I’m detailing my not-so-secret methods. American Library Association has a massive list of awards, I will include only a few on this list to keep it under control! I like to visit professional sites devoted to reviewing and discussing children’s literature. The Horn Book‘s website has not only reviews, but a rich array of materials and articles about choosing books, using books at home and about the authors/illustrators. My favorite book review source is Kirkus Reviews. I read every book with a starred book review that I can. School Library Journal. The SLJ site includes reviews, news and several excellent book blogs. Booklist. You have to have a subscription to get access to all their content, but you can still find many reviews and book lists without one. Independent bookstores have much, much better curated collections than chain stores, which are often overpopulated with syndicated characters and books which play music. I can’t visit bookstores very often due to my intense desire to purchase books, but whenever I do, I always find some little-known (at least to me) gem. I visit the library, of course! Many people take a look at the “New Books” shelves, but don’t forget the librarian display. I always snag books from the display! Attending story time will also introduce you to books librarians know will appeal to children. Those librarians know their books, people. Occasionally I visit personal library sharing sites like Goodreads or Library Thing. Many readers swear by Goodreads, but I don’t use it very much. These websites offer recommendations based on your likes and dislikes, plus you can view lists of what others are reading and read reviews. Here’s a list of the Reading Rainbow books on Goodreads! So that’s it folks! Those are my highly classified tips for how to find good children’s books. Of course you can simply continue to rely on me to do the heavy listing by bookmarking the index of all my book lists (Did I mention I have over 200 now? ), or for chronological browsing, visit my books category archives. And don’t forget to subscribe to our email list and be the first to know about our new Monday book list each week. I've been planning to do a similar post… someday! I use a lot of the same resources that you do, including the displays at our local indie bookstore, the indie list they always have available, put out by some sort of indie bookstore organization, and, of course, the NY Times. Mostly I read your blog. Seriously. Plus Natalie's weekend blog hop. Love the suggestions I get this way! This is excellent. I get a lot of recommendations from WMCIR and also often pick “what looks good” on the library shelves. I used to be addicted to book lists but found that my tastes are not always the same as the list collector's, so now I take them more as a guide. This is a wonder list of book ideas. I'm continually looking for wonderful books for my girls. You have some nice tips. Thanks for the mention! I'm flattered that you read my blog posts. I follow the same steps you do to search out worthy children's books to review. I also pay attention to publisher's catalogs and follow industry news like Publisher's Lunch, etc. And I make a point of asking my niece and nephews what books they're reading and enjoying. Great post! Thanks so much for the Chicken Spaghetti shout-out! I am SO with you on the book list addiction. Don't you love 'em! One of the places we have been looking lately for books is Homeschool Literature . We are homeschoolers, and so were looking for a place where the heroes and authors were something my daughter could relate to. There are reviews on that site as well. Oooh, thanks so much for all the links to book-review sites and blogs! I had only known about half of them before. Thank you! 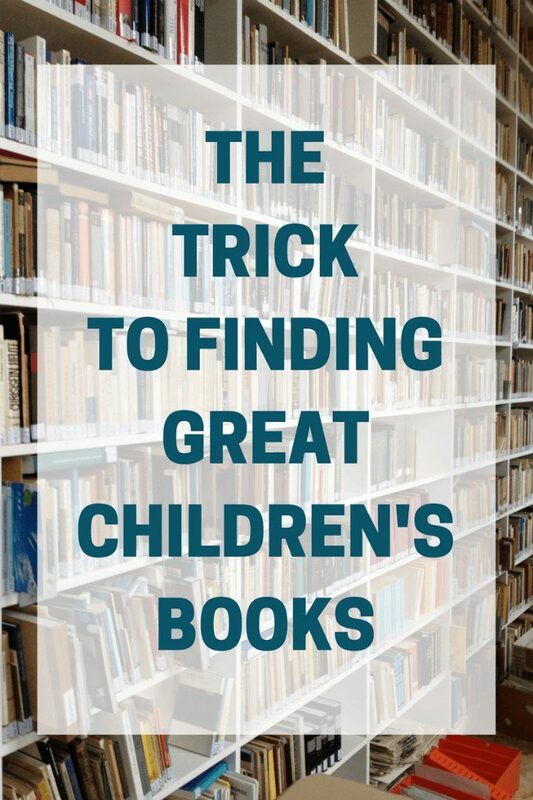 A friend just asked us how to find good books when she can only manage quick visits to the library with her two little kids, so I was happy to be able to point her to your post! I love this post. I am going to link it up on my Book Search linky! Thanks for sharing. What a fabulous, informative post! Thank you for sharing your strategies, and I LOVE that you posted about libraries and librarians. I'm a teen services librarian and I review books for School Library Journal, so I'm really glad you find library resources useful. Some libraries offer resources such as NoveList to find read-alikes. 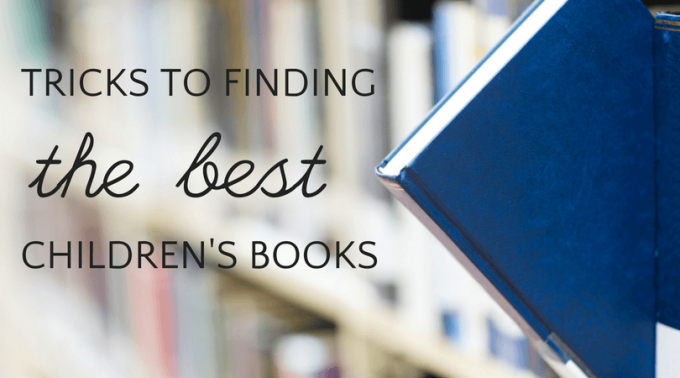 That's particularly helpful for finding books for older kids that have preferences. And marvellous links for a newbie blogger like myself. Such practical and informative suggestions with lots of new resources to look into. Thanks. This was my Children's Bookshelf Featured Post of the Week. Feel free to pop over and grab a featured button. A few years ago I went to a conference that gave the best books list. The presenter went through each book and why it was so great. We were told the big book stores are paid to present certain books. This is why when you look at the presentation shelves you see celebrity authors etc. I do wish I had an independent books nearby. I agree with following Amazon lists and who buys books. I often will order books from the big stores, go in to read and then only purchase those I deem worthwhile. but how do you keep up with all the books you want to read? You don’t use Goodreads for that? As a new homeschooling mom and a fellow (but restrained) book (and list) addict your blog is a godsend and you are opening up my world. My kids won’t know what hit them. Now if I could just get them to listen to my recommendations instead of just following the current book trends. I use a combination of Pinterest and LibraryThing, which is like Goodreads. I do wish I was a little more organized about it. I usually put a book on hold at the library as soon as I hear about it. Also searching for other books by the same Author, and even more interestingly, the same illustrator. Obviously if it’s a big name the results are predictable, but I’ve found some amazing books this was (especially through illustrators). I also like like looking at independent children’s book publishers of other nations… Canada, Australia etc. Niche publishers can have great books too, even if you nominally aren’t part of their target audience, such as Waldorf publishersetc. I found the Fairchild Family Series in a Christian homeschool publishers. I’m not christian, but the book isnt either…the family in the story. is just very wholesome and wonderful. Thank you for some wonderful new links to explore!